This post includes a review of The Last Jedi… which, appropriately enough, will probably be the last Star Wars movie review on this blog. Unless I decide to go back and review the original Star Wars or Empire someday. Some might ask why a classic comics blog should take the time to review a modern movie like this at all. Fair question. The simplest, most truthful answer is “because I feel like it,” but I might add that Star Wars has existed in comic book form just as long as it has in film form, has a lot of crossover audience with comics fans, and some of the problems with these later SW films parallel problems with modern comics, film, and television. Hence, I feel, its worthiness of examination here. Cover art for Journal #37 by John Workman and Bob Smith. If there was any suspense as to how Kim Thompson’s review of the comic would go, the article’s title kinda gives it away: “Marvel’s Fouled-Up Filmbook.” His primary criticism is that Roy Thomas’s script is too slavishly devoted to the shooting script, lamenting that the comic didn’t play to the strengths of the comic book format more. 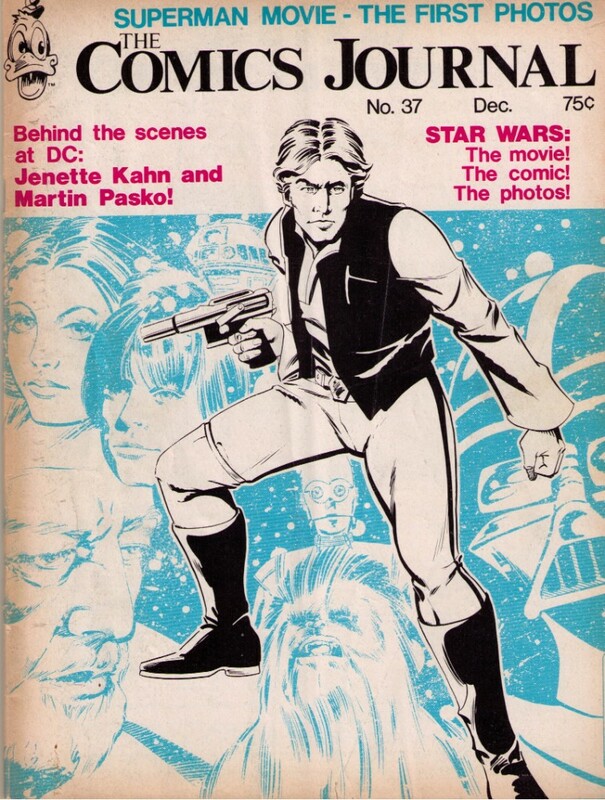 He was also put off by some of the art by Howard Chaykin, particularly when it came to the famous cantina scene. Now I’ve got to agree with him here—without the constraints of a make-up and special effects budget, this was the one area where the comic should have easily outshined the film. Instead, it looked worse somehow. Now in fairness to Chaykin, he may have been operating under an editorial edict to hew closely to the film, and perhaps was not allowed to get too imaginative or creative as a result, but at the same time I can’t help but imagine what it would have been like had Star Wars come out in the 60s and Kirby or Ditko had drawn the adaptation assignment. The mind boggles at the thought. The film doesn’t even provide the good- looking hero and heroine of the old Flash Gordon strip; it has nowhere near the romantic invention of, say, Edgar Rice Burroughs’s Martian novels, featuring that dashing Virginia gentleman, John Carter, and the lovely shocking-pink princess, Dejah Thoris. Here it is all trite characters and paltry verbiage, handled adequately by Harrison Ford as a blockade-running starship pilot, uninspiredly by Mark Hammil as Luke Skywalker (Luke for George Lucas, the author-director; Skywalker for his Icarus complex), and wretchedly by Carrie Fisher, who is not even appealing as Princess Leia Organa (an organic lay). The one exception is Alec Guinness as the grand old man Ben Kenobi (Ben for the Hebrew ben, to make him sound biblical and good; Kenobi probably from cannabis, i.e., hashish, for reasons you can guess). Sir Alec has a wistful yet weighty dignity of tone and aspect that is all his own; why he should waste it on the likes of Luke, whom he befriends, protects, and bequeathes the Force to, remains the film’s one mystery. John Barry’s set design is compelling, as are John Mollo’s costs; John Williams’s music is good when it does not heave too much; the cinematography is striking, as Gilbert Taylor’s work always is. Kudos are due, no doubt, to each member of the production staff, which extends to an unprecedented four mimeographed pages. But what you ultimately have is a set of giant baubles manipulated by an infant mind. …This review should give you a good picture of how the literati of the day viewed Star Wars: it was lowbrow trash to them. In fact, all sci-fi and fantasy were lowbrow trash to them. By their very natures, nothing in these genres could ever possibly have any real artistic merit. If some nerd attempted to assert otherwise, he would have been ridiculed. That’s what the struggle was like back in those early days of geekdom. But were the literati right? Were the characters really that weak? Let’s take a look. We’ll start with the series protagonist and best character. As we begin, we find Luke Skywalker living with the aunt and uncle that raised him. The fact that they did so in the absence of his true mother and father leaves Luke with an inflated sense of indebtedness to them, as evidenced by his all-too-clear desire to leave Tatooine juxtaposed with his continued presence there. Based on their conversation at the dinner table, you can tell Luke’s discussed this desire with his aunt and uncle on several occasions before, been made certain promises about when he can leave, and had those promises reneged upon by his uncle. Yet he stays. When Luke drops the name “Obi-Wan” in the midst of their meal, his aunt and uncle give each other a look. After Luke walks out, his aunt mentions that he takes after his father and his uncle laments that such is the case. What does this tell us? A hell of a lot, actually. It tells us that there’s a great deal of significant history in the story of Luke’s parents (or at least his father) and that his aunt and uncle are keeping this from him. On some level or other, Luke must know this and resents them for it. This resentment leads to guilt over having such feelings for the two people who raised and cared for him, which in turn increases that aforementioned inflated sense of indebtedness. There’s less than ten minutes of total screen time between Luke and his aunt and uncle, but from this relative glimpse we get a whole lot. That is, if you’re looking for it and can see it. Earlier, Luke had expressed a reluctance to join Ben Kenobi in his journey to return the droids to Alderaan, with Ben observing that his words were his “uncle talking.” Now, with his aunt and uncle gone, Luke’s openly expressing his deepest desires for the first time. Characters like Leia, Ben/Obi-Wan, Darth Vader, and Han Solo get less development, as we don’t get the same glimpses into their backgrounds that we do with Luke, but we still end up with at least some basic sense of who they are. Leia is in a position of great responsibility and leadership at a very young age, and despite her youth she attends to her vast responsibilities remarkably well. She gets right in the faces of both Tarkin and Vader fearlessly. She resists the mind probe. When threatened with the destruction of her homeworld, she still doesn’t give up the true location of the rebel base. And after being freed from her prison cell by Luke, Han, and Chewie, she is not shy about taking charge. So despite her relatively limited screen time here, what we see of Leia tells us a lot about her character. Ben may be old when we first meet him, but what’s revealed of his past offers some important facts. He was a hero, a powerful Jedi, and held a position of some esteem in the old republic. He seems like a peaceful, gentle soul… up until he chops off an arm with his lightsabre in that cantina in Mos Eisley. Clearly, the old man has still got some badass in ‘im. It’s also clear that there’s a much deeper backstory between Ben/Obi-Wan and the Skywalker family and Darth Vader, but this was purposely not detailed, with an eye toward the (then still hoped for) future films. Darth Vader was a stock villain in the first installment, but even here there are many hints of greater depth. He’s part of the Empire, but not really—some of the regular-military types view him as a relic from a more superstitious age and don’t seem to respect him as much as they should. (Vader can correct this on a case-by-case basis with a literal flick of his finger, as we’re shown, but it doesn’t solve the larger problem of his alienation from general humanity.) And again, there are hints of a connection with Kenobi and the Skywalkers that was purposely left open ended for future exploration. Han also seems a bit one-dimensional at first blush—he’s your garden-variety selfish crook who’s only out for himself. He remorselessly guns down Greedo in cold blood and makes a lot of noise about getting paid throughout the film. Then when it appears he’s cut out (after finally getting paid, of course)… psych! He pops up again at the last minute to help get Vader off Luke’s tail so he can (spoiler alert) blow up the Death Star. All in all, a nice little arc for a character that was originally written to be a minor supporting player in the story. I think the final verdict should be obvious, based on everything I just went over, above. While the droids were a lot of fun and the films would have lost a great deal without them, they were never (contrary to Harlan Ellison’s view) the most “likeable” or relatable characters in the film. When my friends and I played Star Wars in the backyard back then, we were Luke, Han, Chewie, and Vader. (And if there was a girl in the neighborhood desperate enough to play with a bunch of stupid boys, she’d be Leia.) I think we had the dogs play the droids once, but none of us kids ever did. It was the human characters we identified with most, and those characters had a lot more depth than they were credited with at the time (or even today, really). After going over it as I have here, my love and admiration for the original series has increased tremendously. This was a great movie by nearly any standard with wonderful characters. Can these new films say the same?